Illinois Humanities is proud to revitalize the Gwendolyn Brooks Youth Poetry Awards. Gwendolyn Brooks summed up the contest best in a note from 1977: “All the children who entered the contest are winners . . . . They worked hard. They created. And that is what is important.” With this spirit in mind, we’d like to thank everyone who submitted a poem. We’d also like to thank all of the teachers, librarians, parents, afterschool mentors, and others who supported and nurtured young writers throughout Illinois: you’re supporting the next generation of poets in Illinois! Below are photos from the Gwendolyn Brooks archive at the University of Illinois Urbana-Champaign’s Rare Book and Manuscript Library and more information on the history of the Awards. The Youth Poetry Awards are first mentioned in a press release dated October 8, 1969. 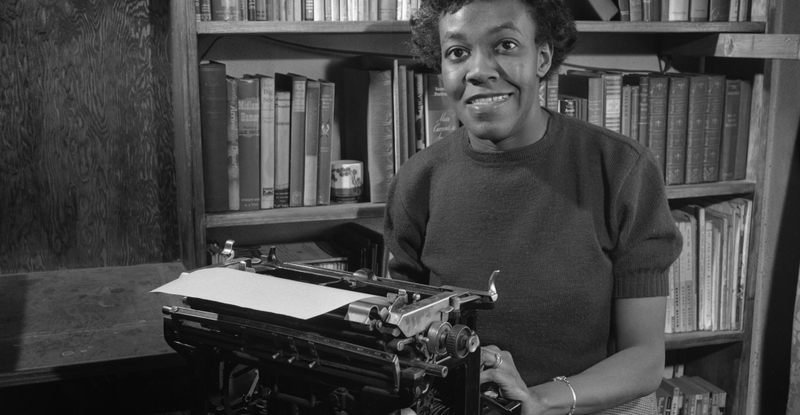 For the next 30 years, Gwendolyn Brooks, the poet laureate of Illinois, would personally steward the awards—writing guidelines, sending out flyers to school across the state, supervising the selection process, notifying winners, speaking at the awards ceremony and, most importantly, corresponding with the hundreds of student poets, parents, teachers, and administrators impacted by this experience. The New York Times would later report that Brooks spent $2,000 or more of her own income annually on the Awards. Over the years, the Awards would expand to honor works by students from kindergarten through college before finally settling upon celebrating K-12 poets. From 1976 onward, the University of Chicago hosted an annual awards ceremony in which these students were publicly acknowledged. Why did Brooks create the Youth Poetry Awards in the first place? While sticking to this criteria, the guidelines for the 1979 contest changed slightly to encourage poems that both “rhyme or rhyme less.” This change may have come in response to a letter from a thirteen-year-old poet written to Brooks a year prior. In the letter, the poet, who is deaf, writes that his entry was rejected by his teachers because its lines didn’t rhyme even though he’d noticed that the lines of poems by Carl Sandburg, Brooks’s predecessor as Illinois Poet Laureate, didn’t rhyme as well. In the margin to the letter, Brooks scribbled “These teachers are ‘criminals,’” reflecting her sustained belief in taking students seriously as writers and as individuals.